Token-curated registries (TCRs) are an emerging crypto-economic primitive that may become a favored building block in the token engineer’s toolkit. Already, we are seeing many teams utilizing TCRs in the design of their platforms. 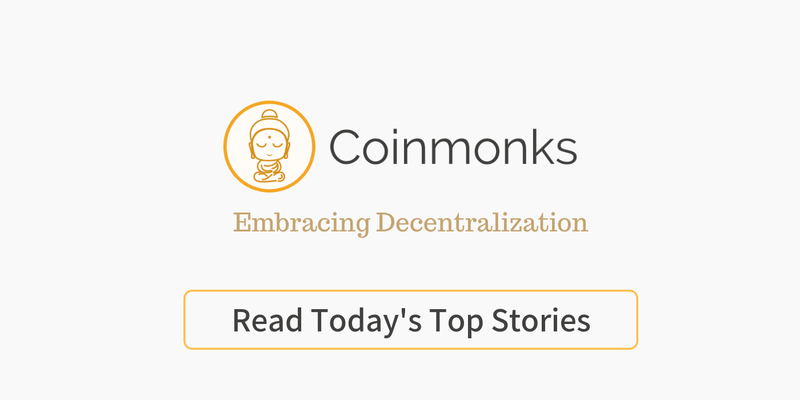 Given this surge in popularity, it is critical that the community thoroughly studies the incentives at play in TCRs and engineers a sustainable and robust protocol. As the saying goes, “show me the incentive and I will show you the outcome”. In this post I will distinguish objective from subjective curation and demonstrate that the current TCR protocol does not appropriately incentivize objective curation. I will then propose a general protocol alteration that leverages this distinction to achieve a more granular incentive model that can be applied to any TCR. TCRs can come in all shapes and sizes. While TCRs always address a binary property, this property can exist on a spectrum from completely subjective to completely objective. For example: “is this restaurant in Chicago good or bad” is a fairly subjective property whereas “is this individual a licensed physician in the United States” is fairly objective. Objective: Curators who scrape the list for applicants/members who fail to meet the 2 objective requirements in the hopes of winning an easy challenge. Subjective: Curators who are passionate about baseball and feel so strongly about the members who deserve to be in this TCR that they are willing to put their money behind this. It seems unlikely that this TCR will attract the attention of the so-called “objective curators”. The opportunity to economically profit is too infrequent and likely not worth the effort. Yet, we can reasonably expect most applicants to undergo a challenge and for every challenge to have a fairly dynamic voting round. This TCR demonstrates that the incentive models for curation of subjective properties differ from those of objective properties. While I agree with Mr. Bulkin on point (2), I partially disagree with him on point (3) and fully disagree with him on point (1). When I first began thinking about TCRs in October 2017, I focused most of my reasoning on the concepts of work (W) performed by curators (i.e. How much work is required of the token-holder to reliably identify a non-reputable actor?) and payment (P)(i.e. What is the financial reward for honestly performing the work and reporting your findings to the network?). I reasoned that curators are solely motivated to maximize their payment-to-work ratio (P:W). With respect to point (3), notice that the concept of a P:W ratio comes in conflict with the condition of cheap observability. Cheap relative to what? If it requires 10 hours of work to review an application to a TCR, is this necessarily less cheaply observable than a TCR that requires 5 hours of work but pays 1/3 the reward? It is not a matter of ease of observability so much as appropriately incentivizing the task at hand. To point (1), my thought process in October 2017 led me reason that the P:W ratio was incalculably low when it comes to subjective opinions. This led me to conclude that subjective TCRs were not viable. However, I now believe this was a faulty determination. Rather, the P:W ratio should be applied only to the objective components of a TCR property and factored out as an independent variable in the incentive model. The subjective aspects of the TCR can then be curated by the crowd just like any other prediction market. In the case of TCRs that address subjective properties, one can reasonably expect an active curation community resulting in frequent contentious challenges and subsequent voting rounds. This is not to say that all TCRs are guaranteed an engaged and enthusiastic community of curators, but just to say that subjectivity is not antithetical to a functional TCR. By way of the previous example, it seems that under the current TCR protocol, it is the TCRs that address objective properties that will inevitably fail to produce the appropriate incentives for continued verification. The only initial opportunity to economically profit from the existing TCR design is to successfully challenge a nefarious applicant to the registry. In the case of objective properties, knowing that a nefarious application to the registry will almost certainly be challenged resulting in loss of the deposit, we can reasonably expect there to be minimal nefarious applications. Resultantly, challengers have minimal opportunities to economically benefit from their curation efforts. In other words, the P:W ratio trends down as the TCR property becomes more objective. Challengers cease to participate in the curation process thus allowing nefarious applicants to be admitted to the registry. These poorly aligned incentives prevent an acceptable equilibrium from forming and result in a registry of suboptimal utility. An extreme example of this occurs in the TrueBit protocol — solvers submit computations with the expectation that a challenge will be raised if the computation is not performed correctly. Because computation is extremely objective, there exists a near-zero probability of discovering challengeable errors. To solve this problem, TrueBit introduced the concept of “forced-errors” in which solvers randomly submit intentionally incorrect computations at some probability that ensures diligent challengers will enjoy a profitable return on their verifications. The concept of forced-errors gives the crypto-economist the ability to control the P:W ratio at the protocol level. How can this be applied to ‘human work’ as opposed to the ‘machine work’ occurring in the TrueBit protocol? The answer is to separate all objective aspects of the underlying TCR property and establish the value of that curated signal. In the case of the Baseball Hall of Fame, the value of curating the objective aspects of the TCR is pretty low. However, take for example the Messari TCR, which recently detailed a “standardized disclosure format” for projects that wish to be whitelisted in their TCR. 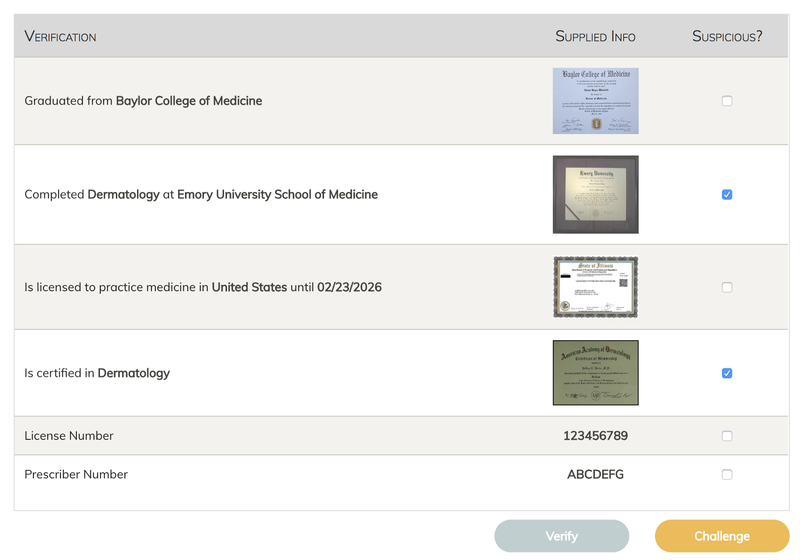 Alternately, in the MedCredits TCR, curators are tasked with reviewing credentialing documents and license information that are publicly available and objectively define who is and who is not a physician. How does one create a forced-error when it comes to ‘human work’? The first step in designing this TCR is to explicitly consider: what are the objective fields of curation? In the MedCredits TCR, we can distill the exact objective curation items into the various documents required of an individual to legally perform the services of a physician. Once the objective fields have been determined, every possible option for each field can be assigned a value within an array. Prior to submission of a new application, the applicant generates randomness on the client-side swapping one item in an array for another. This effectively inserts a forced-error that would be well-masked unless a curator actually performed the necessary items of work. For example, Baylor College of Medicine could be substituted to Columbia University College of Physicians and Surgeons or a random 9 digit number could be substituted instead of the provided license number. An applicant then submits two hashes to the blockchain representing both the accurate application and the application containing the random forced-error. Much like the TrueBit protocol, a forced-error is determined by combining random bits generated on the applicant’s client and the hash of the block mined immediately following the submission of the application hashes. Once this information is available, the applicant designates which of the two hashes references the application that curators should evaluate. Curators then review the designated application and make a determination on whether a challenge is warranted. A substantial change to the current TCR protocol is the possibility of multiple challengers. Because the applicant is the first to know whether a forced-error is in effect, they will likely submit the first challenge. This would defeat the entire purpose of introducing forced-errors. Rather, multiple challenges are permitted during the challenge period. 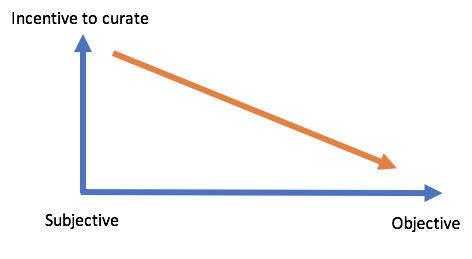 To prevent sybil behavior, the total reward paid out to the challengers is dependent on the number of challenges, n, and is product of 1/(2^(n-1)). Following the challenge period, the applicant reveals whether a forced error is in effect. This determines: whether a voting round must be held, if the applicant gains admittance to the registry and how rewards are paid out to all the stakeholders (see figures below). When it comes to the curation of objective data, it is necessary for the protocol to fairly and predictably reward curators for the work they perform. Therefore, after determining the objective fields of curation, the crypto-economist should make a rough estimate as to afair value of this objective curation (this can be tweaked over time ideally through some form of decentralized protocol governance). In order to continually reward curators, the protocol must secure funds for these payouts. This is done through a non-refundable “application fee” paid by every applicant to the registry. 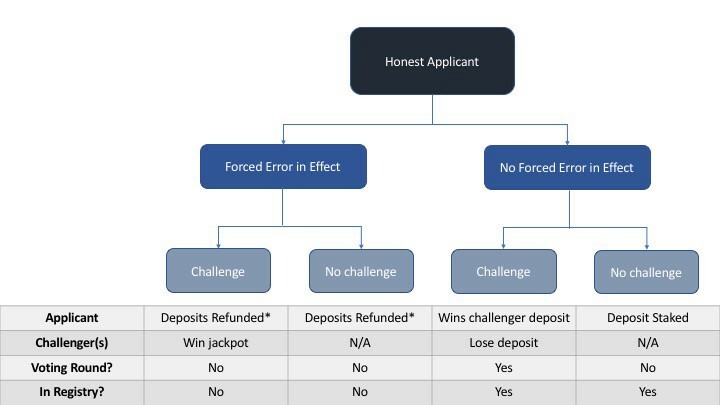 The application fee is distinct from the staking deposit and is used to fund the jackpot that pays challengers who challenge forced-errors. 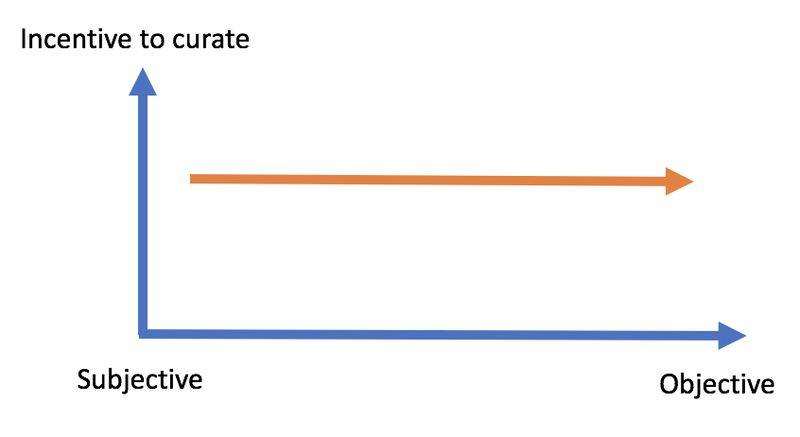 The reward for the work of objective curation is controlled by the frequency of forced-errors and the size of the application fee as defined by the protocol. Though the field of token engineering is in its infancy it is already showing signs of maturation. In this post I have distinguished subjective from objective curation tasks and suggest that this distinction should be explicitly considered at the protocol level. Blockchains are incentive machines. The more atomic our understanding of the underlying incentives, the better we can design systems for specific outcomes.